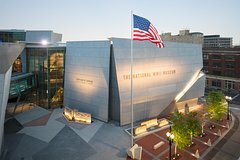 Head inside The National WWII Museum with your general admission ticket and start exploring the captivating exhibition space at leisure. The Museum tells the story of the American Experience in the war that changed the world—why it was fought, how it was won, and what it means today—so that all generations will understand the price of freedom and be inspired by what they learn. Guaranteed to move and educate, The National WWII Museum features interactive exhibits, soaring aircraft, personal histories, and more. The heart of the Museum experience, Campaigns of Courage: European and Pacific Theaters brings visitors inside the story of how the war was won. Two immersive exhibitions—Road to Berlin: European Theater Galleries and Road to Tokyo: Pacific Theater Galleries—feature environmental exhibits that guide visitors chronologically through the narrative of each theater of combat, using a sophisticated mix of set design, narrated and environmental videos, period newsreels, interactive oral-history kiosks, personal and digital artifacts, and dynamic displays for a uniquely evocative experience. How long you spend inside the museum is up to you! If you are hungry or simply want a break from exploring the exhibits, visit the on-site American Sector Restaurant + Bar and take a step back in time in BB’s Stage Door Canteen, a 1940s-style entertainment venue that showcases the music and performers of the war years. Food and drinks are at your own expense.